Any large installed base doesn’t always stay that way. Fickle customers continue experimenting and switching between platforms and ecosystems. Microsoft continues to meet challenges from Apple, Google, and countless others, as users continue their quest for what they see as the best. Despite the size and breadth of the installed base, Microsoft’s customers for certain products and services are not as average as may be expected. Understanding just how large the Windows installed base is begins with some basic measurements. 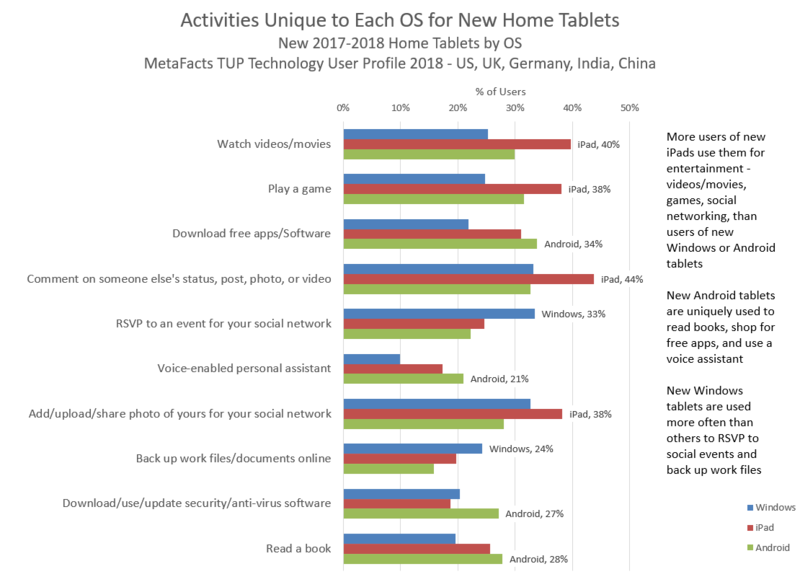 How many adults use Windows OS devices, and which types of devices dominate? Most American adults use a Windows device, with 170.4 million using some type of key connected device. This means more than three-quarters (78%) of American adults use any combination of one or more Windows PCs, Smartphones or Tablets. This level of dominance appears to spell strong security for Microsoft. It’s important to look one level more deeply – to the types of devices being actively used which are and aren’t using Windows. Another 47.8 million adults are actively using a connected device using any other operating system than Windows. This defines a substantial portion of the market outside of Microsoft’s Windows ecosystem. Microsoft Windows’s strongest domain is on Desktop and Notebook PCs. 166.3 million adults actively use a Windows PC, while 27.6 million only use a PC (or Mac) that doesn’t run Windows. When it comes to Smartphones, Microsoft Windows hasn’t made a substantial lasting presence. Of the 170.6 million adults using a Smartphone, only 4.5 million use a Windows Smartphone. Tablets have been stronger for Microsoft, especially with its relatively recent release of the Microsoft Surface line. Of the 132.9 million US adults who regularly use a Tablet, 25.6 million run Windows. How many adults use PCs, and which operating systems dominate? 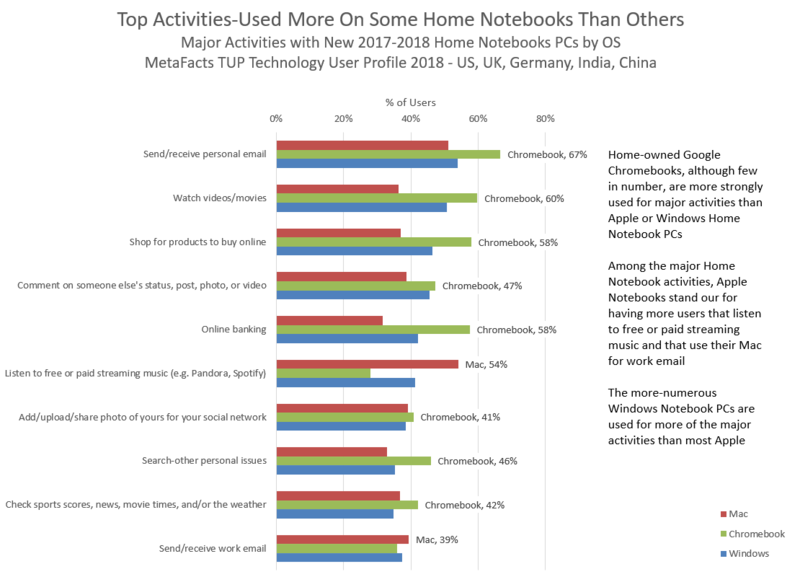 PCs continue to dominate the collection of connected devices in active use. 193.9 million adult Americans use a Windows, Mac or Google Chrome OS PC. There are connected adults who don’t use a PC, and these number 24.3 million. The lion’s share of adults actively use PCs running Microsoft Windows. 166.3 million adults actively use a Windows PC, while 27.6 million only use an Apple Mac or Chromebook. Apple has a much smaller share of adults who use one of their Macs or MacBooks. 44.4 million adults actively use an Apple PC. There is an overlap of 24.2 million adults, meaning that over half of Apple MacOS users also actively use a Windows PC. Looked at from Microsoft’s perspective, only 15% of Windows users actively use an Apple PC. Google’s Chrome OS PCs have a nominal share. 3.1 million adults actively use a Google OS PC. How many adults use Smartphones, and which operating systems dominate? 170.7 million adult Americans use a Smartphone, using Google Android, Apple, Windows or any other OS. At 78% of connected adults, this penetration is very high. Another 47.5 million use a connected device other than a Smartphone. We expect most these holdouts, many of whom are using Basic feature phones, to eventually migrate to a Smartphone, if begrudgingly. However, the majority of new Smartphone sales will be into a replacement market, as subscribers update their handsets. Google Android leads now in Smartphones. With 80.8 million adults million adults actively use a Google Android Smartphone, this is slightly higher than Apple’s 77.8 million adult iPhone users. Microsoft Windows phones, however, are only in the hands of 4.5 million connected adults. 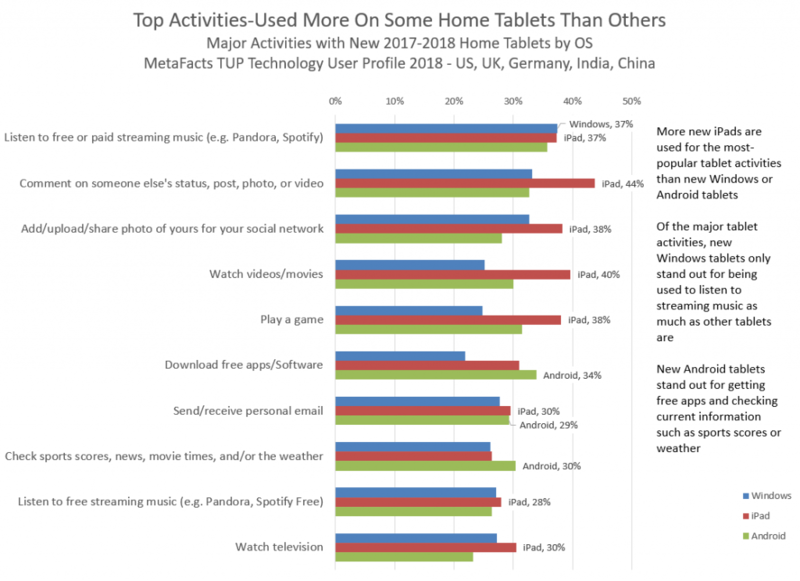 132.9 million adults are using at least one Tablet, leaving 85.3 million connected adults not actively using one. Apple’s iPad has the largest share of the installed base, with 63 million active users. Apple’s share, however, has been shrinking with broader acceptance of increasingly sophisticated and more heavily marketed tables using Android and Windows. With 36 million Android Tablet users, Google has a strong base, even if well behind Apple’s. Windows, with 25.6 million users, lags behind both leaders. However, considering that Windows Surface tablets were released starting in 2012, expanding to this size base is impressive. The current installed base of Desktop PCs is dominated by Microsoft Windows. Apple has started to make inroads with its Macs. Among the newest Desktop PCs in the installed based, , Apple’s share is effectively one-in-five, at 21%. This is stronger than Apple Macs in the installed base which were acquired in 2015, where Apple’s share is one-in-six, at 17%. The current installed base of Notebook PCs continues to be dominated by Microsoft Windows. Apple has gained a substantial share, with nearly one-quarter (24%) of the installed base. Historically, Apple has been very strong among younger adults, especially students. In fact, while 77% of adult students use some type of Windows PC, this is a smaller share than the average adult. At the same time, one-third (33%) of students use at least one type of Apple Desktop or Notebook, a share substantially higher than the national rate of 23%. Google’s Chromebooks, although have achieved broad media attention, are only being actively used by very few users. Among adults using Notebooks acquired in the first half of 2016, Google’s share is 3%, and 4% for those acquired in 2015. Microsoft only has a sliver of the Smartphone market. The current installed base of Smartphones in the US is dominated by Google (Android) and Apple (iOS). In the total active installed base, Google has a nearly-identical share to Apple. Looking more deeply into which OS dominates newer phones in the US, Google has the largest share. Just over half – 55% – of Smartphones acquired in the first half of 2016 are using Google Android. That’s up from half (50%) of Smartphones acquired in 2015, and even lower shares in older Smartphones. Windows Smartphones are ranked 3rd, with a nominal share that’s been declining. Microsoft Windows has a fresher share of the installed base of actively used tablets than ever before. Despite that, Windows tablets are ranked 3rd behind Apple iOS and Google Android. Apple’s iPad is the darling of Tablets, currently with the dominant share of the installed base of actively used tablets in the US. However, Apple’s dominance has been challenged by both Microsoft and Google Android tablets. Apple’s share is still dominant among recently-acquired Tablets, and yet the trend isn’t favorable. Apple has its largest share among older tablets actively used in the installed base. Google Android & Chrome OS tablets have a share growing towards Apple’s, and are a substantial threat to both Microsoft and Apple. We’ve found predictive power in looking at tech purchase plans in the context of what they are already using. Among other factors, habit and inertia are strong among many consumers. Google has some positive prospects. 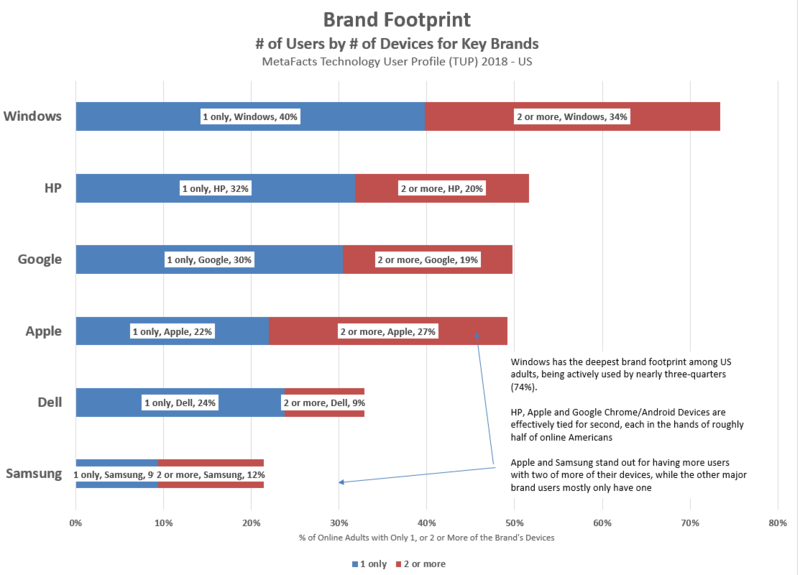 Consumers who have been avoiding Google devices make up the strongest segment planning to buy a Chromebook, and are relatively strong for Android Tablets and Smartwatches. It’s not surprising that another strong segment for Chromebooks are those avid tech device collectors who have all 3 major OS families – Windows, Apple, and Google. Plans for Apple products, however, aren’t showing strong growth prospects outside of Apple’s base. Apple avoiders are one of the smallest segments with plans to buy an Apple iPad, iPhone, or Apple Watch. There is home from the accumulators – those active consumers who are using all three OS. Purchase plans for Microsoft Windows Smartphones are coming from a mixture of the converted and departed. Nearly as many are Google avoiders as have all 3 OS. Also Windows-only devotees have plans to stay within the fold for their next Smartphone. Looking ahead, Microsoft’s recent desktop PC announcement with the Surface Studio was received favorably by many tech reporters and analysts. Although most likely to be bought by high-end creatives, technology-laden products like this can have a halo effect on franchises like Windows, lending them an advanced aura. This sizzle, in turn, can help stem the tide of users who have been switching away from Windows.